Persistence Market Research (PMR) provides an exclusive analysis of the “Global Loader Crane Market” in its new report. The market intelligence compiled in this report offers exhaustive analysis and provides insights pertaining to the loader crane market. The report offers a comprehensive analysis of the global loader crane market in terms of market volume (Units), value (US$ Mn) and year-wise (Y-o-Y) growth in sales as per product composition and applications. To offer a better understanding of the loader crane market, the report offers analysis of drivers, restraints, regulations, opportunities and trends and their impact on the market dynamics. Crucial insights provided in the report highlight two important segments of the loader crane market: loader crane by lifting moment, boom length and platform and end-use; and loader crane analysis by region. In the following section, the global loader crane market offers crucial insights and analysis on the basis of regions, including North America, Latin America, Western Europe, Eastern Europe, South East Asia and Pacific, China, India, Japan and the Middle East and Africa. The concluding section of the loader crane report offers important insights on the competitive landscape of the global market. 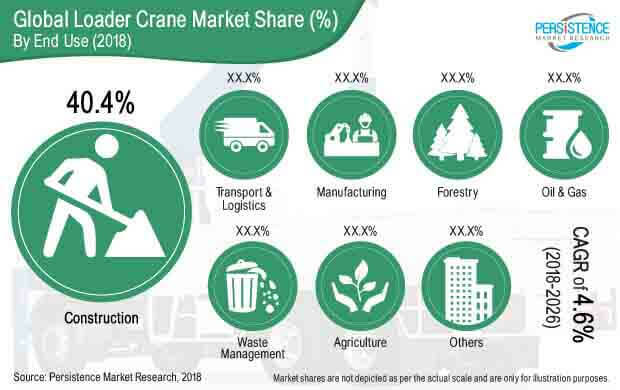 In this section, the loader crane report provides market share analysis and provides information and analysis of key companies and manufacturers operating across the value chain and their presence globally. Some of the players reported in this study on the global Loader Cranes market are PALFINGER AG, Cargotec (Hiab), Fassi Gru S.p.A., ATLAS Group, Tadano Ltd., Cormach S.r.l., PM Group S.p.A., Next Hydraulics s.r.l., Hyva Group, Prangl GmbH, Zoomlion Heavy Industry Science & Technology Co., Ltd. and XCMG. The loader crane market’s volume has been derived through in-depth research and validated by industry experts and key manufacturers/solution providers through interviews. Perspectives of the industry experts were thoroughly analyzed and the average loader crane market volume was deduced and reconfirmed before being incorporated in the loader crane report. To offer accurate loader crane market analysis, we have considered 2017 as a base number and loader crane sale and forecast has been made for the years 2019 to 2028. The market size of loader crane has been calculated in terms of different lifting moment, platform, boom length, end-use and their selling price in various regions. Further, data points, such as sales split, end-use split and regional split, along with qualitative inputs from the primary research, have been incorporated to provide precise loader crane market analysis. Valuable insights offered in this report estimate the total revenue expected to be generated in the loader crane market over the forecast period. This report on loader crane offers forecast in terms of CAGR and analyzes market on the basis of Year-on-Year (Y-o-Y) growth. Market analysis on the basis of CAGR and Y-o-Y growth incorporated in the loader crane report will allow readers to identify lucrative growth opportunities and growth prospects in the global loader crane market. Valuable insights provided in the loader crane report also offer detailed information pertaining to the potential resources and key trends in the global loader crane market. Insights compiled in the loader crane report have been provided in terms of absolute dollar opportunity and Basis Point Share (BPS). In addition, market intelligence pertaining to growth prospects and patterns of various segments of loader crane have been derived through loader crane market attractive index. Loader cranes find applications in the construction, forestry, waste management, oil and gas industries, etc. Loader cranes are curtail load handling equipment. One of the major advantages of loader cranes is that they facilitate the transfer of goods without the intervention of a second equipment. The global Loader Cranes market is estimated to be pegged at around US$ 3,673.2 million in 2018 and is expected to register a CAGR of 4.6% over the forecast period (2018–2026). Increasing investments made by governments as well as private sector companies in infrastructural development projects is the major factor driving the growth of the global loader crane market. Governments across these emerging regions are launching multiple construction projects in order to strengthen transport and commercial infrastructure in respective regions. This is expected to, in turn, provide opportunities for public-private partnership construction projects in the region. As, a, result, will impact on global loader crane market. Loader cranes are primarily used for high capacity lifting in tall height applications. Use of other lifting equipment for these applications creates significant limitations in terms of lifting capacity, poor driving comfort and difficulty in steering maneuverability. These limitations are overcome by loader cranes as large capacity cranes offer enhanced driving comfort. Thus, demand for such applications is primarily increasing the adoption of loader cranes, thereby driving the global loader crane market. The construction industry in the U.S., Europe, China and India is anticipated to witness growth in large public infrastructural programs, which will create more opportunities for the Public-Private Partnerships to fund new projects. Developing regions must channelized efforts towards strengthening intra-region trade. This is expected to further benefit the construction sector in the region and create opportunities for growth for loader crane market. The global Loader Cranes market is segmented on the basis of lifting moment, boom length, platform, end user and region. On the basis of lifting moment, the global Loader Cranes market is segmented into upto 50 kNm, 51 to 150 kNm , 151 to 250 kNm, 251 to 400 kNm, 401 to 600 kNm and above 600 kNm . On the basis of boom length, the global Loader Cranes market is segmented into less than 11m, 11 to 20m and more than 20 m. On the basis of platform, the global loader crane market is segmented into light commercial vehicles, intermediate commercial vehicles, heavy commercial vehicles and others. The global Loader Cranes market by end user is segmented into construction, forestry, agriculture, oil & gas, manufacturing, transport & logistics, waste management and others. Key regions covered in the report include North America, Latin America, Europe, SEA, China, Japan and Middle East and Africa (MEA). From a regional perspective, the Loader Cranes market in China is projected to witness relatively faster growth over the forecast period. The Europe Loader Cranes market is estimated to account for a share of around 22.8% in the global market, by value, by 2028 end. The market in South East & Asia is expected to register a CAGR of around 6.4% in terms of value over the forecast period. In Loader Cranes market, North America is expected to reach US$ 657.1 Mn by the end of 2028. The Loader Cranes market in Middle East & Africa (MEA) is expected to expand at a CAGR of around 5.5% over the forecast period.